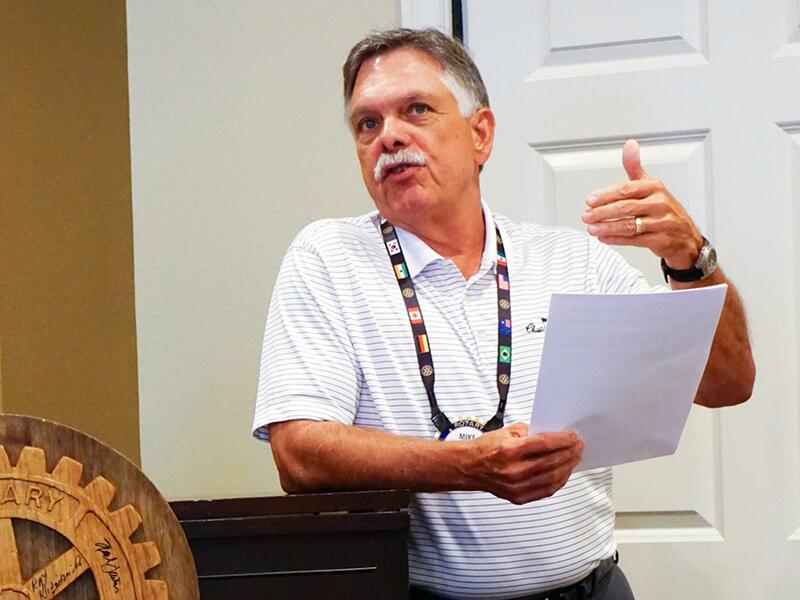 Rotary File for June 28, 2016 | Rotary Club of Iowa City A.M.
Mike Messier gave the presentation on June 28 on Medicare and related health insurance issues. Mark Patton is in the news for his commitment to ride the Lewis and Clark Bike Trail-- all 3400 miles-- over the course of three summers to raise funds for the Iowa Valley Habitat for Humanity. The goal is to raise $35,000 to build a house in the fall of 2017 for the annual Memorial Build. 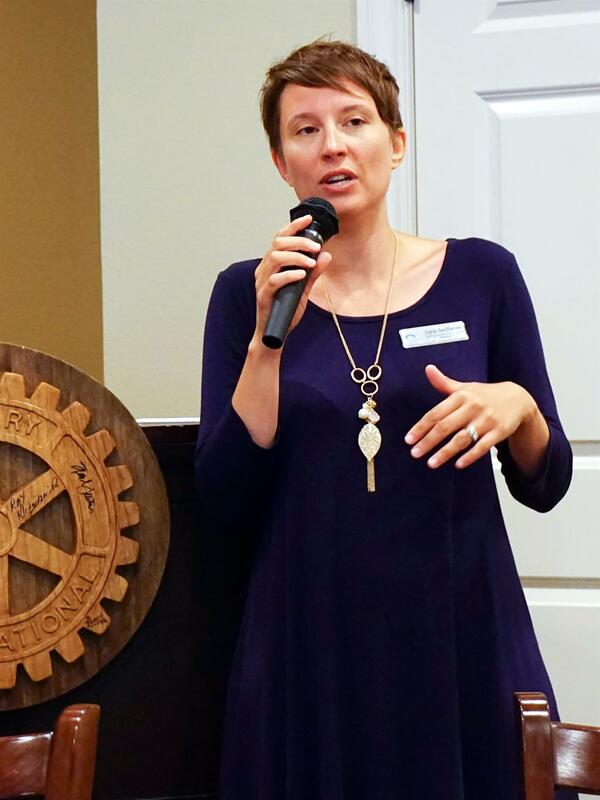 Kris Ockenfels introduced Sara Sedlacek of the Crisis Center who talked about the effort for the four area Rotary Clubs to raise dollars and food for the Crisis Center during the month of July. In effect, the four clubs are doing a "food fight" to see which club can bring in the most food and dollars per capita during July. Four pounds of food will equal one dollar raised. Bring in food or dollars during the month to each Rotary meeting. Crisis Center is trying to bring in 80,000 lbs of food during July for those who are food-insecure in our community. Food brought to the Crisis Center should be market with the name of the Rotary Club to receive credit. Eggs and produce are welcome. Make checks payable to the Crisis Center. Phil Peterson explained about a fundraising poll that was passed out on each table to determine member interest in participating in the fundraisers we have established in the past year, determine the frequency of these fundraisers, and determine interest in doing ongoing can sorting so that we can continue the can project through the Can Shed or other locations such as Hy-Vee. Deb Dunkhase asked for sign-ups to help out with the Take A Kid Outside Day on July 16 at City Park. The Pork Association has donated pork patties and hotdogs for the lunches. The Downtown Club has individuals who have volunteered to do the grilling. We need money donations to buy other food for the lunches and snacks so that the Club can make as much as possible on the food sales. Mark Patton introduced Mike Messier, who spoke on the topic of Medicare and other health care issues for seniors. The issue of maintaining enough assets to extend throughout retirement is a sufficiently complex issue that Mike advised everyone to find a financial advisor before retirement planning is completed. Medicare was the brainchild of Harry Truman, but it took 20 more years until Lyndon Johnson to put the details into place for Medicare in 1965. There are justified fears that parts of the Medicare program will run out of funds in coming years. Two of the trusts are expected to run short as of 2016. Any new revenue will require tax increases. Right now for those over 65 everyone pays between $121 and $180/mo for Medicare Part B. Compared to those who pay for self-insured coverage now once they turn 65 they will find the cost of health care to drop 60-80%. For those not in Medicare expect a typical plan to go up 40% as of January 1. Expect that Medicare recipients will be affected with price increases as well in coming years, and particularly for those who are most able to pay. It is important to sign up promptly for Medicare supplementary insurance Parts B and D. You have seven months after your turn 65 to sign up or expect that you will be fined 10% for every year you remain uncovered. If you work past 65 and stay on an employer's plan you must opt out of Part B. Then when you move off of the employer's plan you now have 8 months to get into Part B. Part B was originally supposed to be just catastrophic coverage but it became general coverage instead. This year the costs went up for the first time and the cost paid depends on your income level. The system now makes people pay more who are more able to afford it. Mike advised that as of now Medicare is a better plan even than the UI health coverage for its employees. It is a good bargain for seniors right now, but expect it to become more expensive over time.